Most people are surprised to learn that a single flea can bite into a host hundreds of times per day. And considering the fact that dogs living in a flea-infested home may have dozens of these blood-sucking parasites on their body at any given time, the problem is clear to see. Thankfully, there are some natural ways to fight these parasites, keeping them away from your dog. If your dog is suffering from fleas, try to get into the habit of bathing them at least once a week. A warm bath using nothing more than standard canine shampoo wash away a significant portion of the fleas. When you’re bathing your dog, you should also try to pick out any fleas you come across, dropping them inside a cup of soapy water to drown. After you are finished bathing your dog, give them a treat as a reward (this will make future baths easier for both you and your dog). Fleas love to hide in the thick, dense brush of poorly maintained lawns. Homeowners who fail to properly maintain their lawn are more likely to experience a flea infestation because of this reason. You can often discourage fleas from entering your home, however, by keeping your grass trim and weeds/brush removed. Shorter grass will naturally deter a variety of pests, including fleas, ticks, centipedes and ants. When was the last time you washed your dog’s bedding? Fleas often hide in and around pet bedding, as this offers a consistent meal for them. When your dog goes to lie down, they’ll be attacked by a swarm of blood-thirst fleas. This is why it’s important for owners to wash their dog’s bedding on a high-heat temperature setting using plenty of liquid detergent. You can’t expect to remove fleas from your dog’s coat by brushing them with a traditional brush. With an average length of just 1-3 mm, fleas are too small for traditional combs and brushes. This is where a flea comb comes into play. Using an array of close, fine teeth, flea combs will catch these pests as you run it through your dog’s coat. With that said, it’s recommended that you transfer the fleas to a cup or bowl of soapy water to kill them. If Fido is suffering from fleas, try spraying them with a solution of half apple cider vinegar and half water. AVC is acidic and contains certain organic compounds that fleas hate. By Spraying it on your dog, you’ll discourage fleas from attacking. Will Crushed Pennyroya Ward Off Fleas? 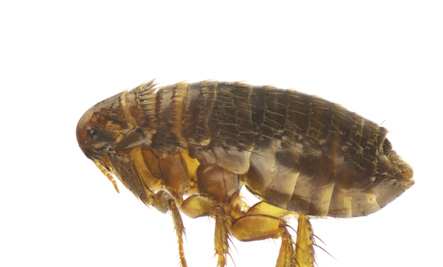 Will Fleas Go Away on Their Own? Why Do Flea Bites Turn Into Blisters?